CDI offers a distinguishing Lifetime Achievement Award recognition to any career coach, resume writer, or other career industry professional who attains excellence through industry longevity, contribution, and lifelong learning. 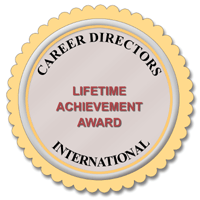 The Career Directors International Lifetime Achievement Award will be conveyed once per year to all CDI members who have met the criteria (listed below). Industry Longevity: Member of the professional resume writing or career services community for a minimum of ten (10) years and a member of CDI for a minimum of the past three (3) consecutive years. Certification: Earn and maintain the Certified Master Resume Writer (CMRW) and/or Master Career Director (MCD) credential. Awards & Recognition: Earn a minimum of two TORI nominations or one TORI award* in the last three (3) years or be nominated for or win one Career Innovator award*. Consideration will be made for a Director of Awards who serves 3+ years and who would thus be ineligible to enter. Continuing Education: Complete a cumulative 45 hours of industry training such as conference attendance or teleclasses over the past four (4) years. Must include at least one CDI course/certification or Annual Summit. Industry Contribution: Sit on a CDI committee for the past one (1) year with approved active participation in at least one major project (course, certification, survey and report). Membership: CDI membership is required. If you believe you have met the criteria to attain this recognition, then please submit your list of criteria to info@nullcareerdirectors.com by August 1st each year. You are required to submit proof of any non-CDI activities. To be considered, please use the category titles above so that we can easily find the match between requirements and your accomplishments and contributions. Deadline is extended to September 21st for 2018.